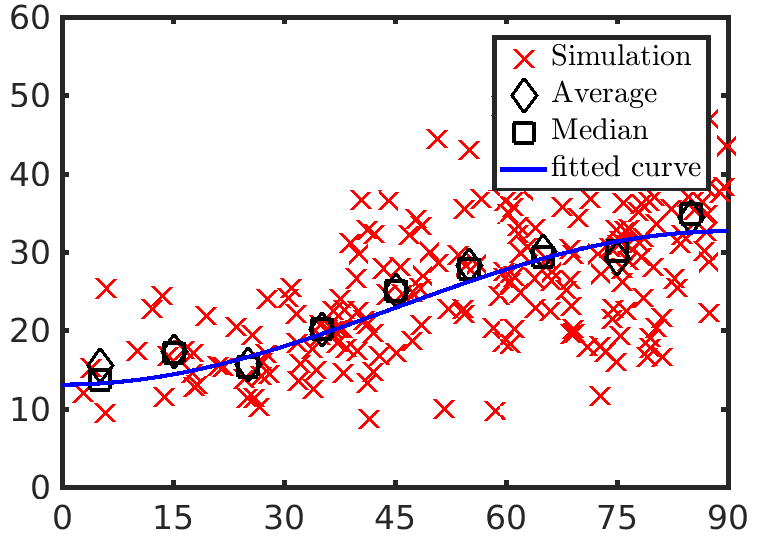 The fitted curve is done by minimizing absolute difference between each data point and the curve. The fit information of interest are y-values at x=0 and x=90. The fit takes a form specified by me. Lets say I have another data set with different x and y-values. I make a similar fit. Now I average the fit information: average y_fit(x=0) from two simulations and similarly y_fit(x=90) from two simulations. Now I make a combined fit using data from two simulations. Will the y_fit(x=0) of combined data equal to the averaged y_fit(x=0) from the two different data sets? Which method is better in terms of accuracy? Browse other questions tagged mathematical-statistics fitting curve-fitting or ask your own question. What are other (standard?) distributions that well fit a beta distribution with parameters 3.1 and 1.9? How do I fit a cumulative Gaussian distribution in R?